Do Catholic schools have catchment areas? Is there a quota of Catholics and non-Catholics? Do we need to be Catholic? If my child isn’t Catholic, will they feel left out? How much Religious Education is there? What can a Catholic school offer my child? What support is there for my child? How do Catholic schools differ from private and independent schools? Have other questions you’d like answered? 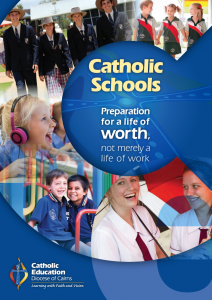 Want information and contact details of all Catholic schools in the Cairns region? No, the 29 Catholic schools and colleges in the Cairns Diocese do not have geographical boundaries or defined catchment areas, so you can choose the school that fits your family regardless of where you’re living. However, as many schools and colleges experience high enrolment demand and may have waiting lists, it’s a good idea to apply to all the Catholic schools that you are considering that might reasonably be considered to be accessible from your home address. This is better than submitting a late application to another Catholic school or college, should you miss out on your preferred one, as other schools will already have made their enrolment offers. Schools will work together to accommodate applications on an understanding that families in some cases will not receive their first preference but every effort will be made to ensure they receive a place in one of their preferred schools. Your child does not need to be Catholic to enrol at a Catholic school and there has never been a defined percentage of Catholic and non-Catholic students that a school must enrol. In fact, Catholic schools in the Cairns Diocese have large numbers of students from non-Catholic backgrounds and are welcoming to all who seek and support their values. Your child’s enrolment will be assessed on its merits against the enrolment criteria, regardless of your family’s faith. While preference is given to students of the Catholic faith, particularly those active in their parishes, there are students from a variety of religious backgrounds. Enrolment procedures can vary from school to school, as individual schools manage their own enrolments. Generally, the enrolment period is Terms 1 to 2 for the following year, although applications are welcome at any time and are subject to vacancies and interview. It’s best to contact the schools you’re interested in directly to find out when to apply. You’ll find some school-specific enrolment information, and contact details for all our Catholic schools and colleges under the ‘Our Schools’ tab on the Cairns Catholic Education website. 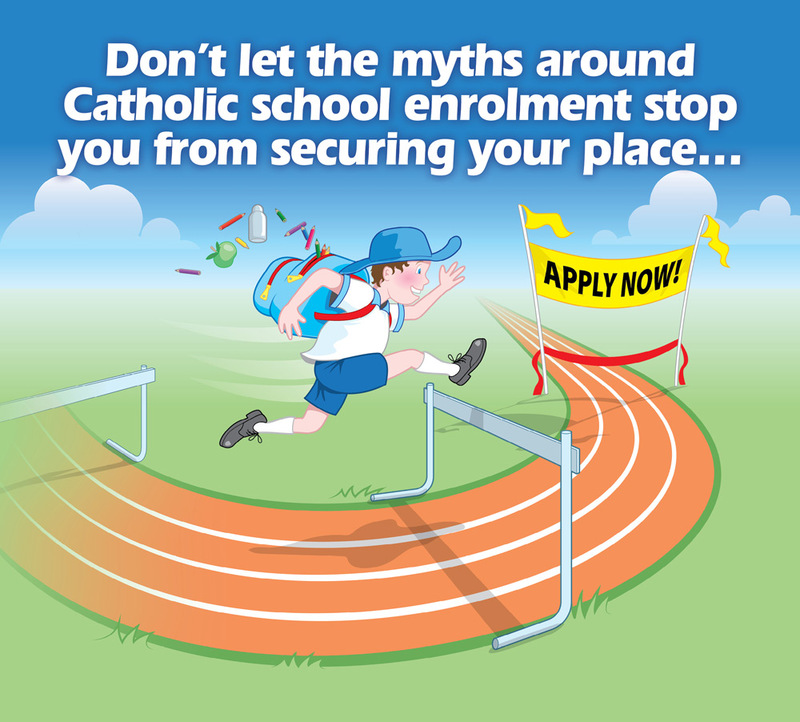 Applying to enrol at a Catholic school in the Cairns Diocese has never been easier! Applications can be made online at every school’s website or the Cairns Catholic Education website. The enrolment procedure for each school can be found on that school’s website, with a link to online application. If applying to more than one school, the online application process only has to be completed once – simply select the schools you are interested in applying to from the drop-down menu in the application. Also, you can return to your application to complete it at any time within 30 days of starting the application without having to restart the application process. For those who prefer a more traditional method, you can pick up printed forms from each school’s office. No, the parents or guardians of a student do not need to be Catholic for the student to attend a Catholic school. Not at all. All religious education which includes the classroom teaching of religion and the religious life of the school, is respectful of all learners and is based on the foundational belief in the dignity of every person. It is a requirement that a minimum of 2.5 hours per week of religious teaching is provided in both primary and secondary schools from P-12. Hence there are 27.5 contact hours in a Catholic school compared to a government school which is required to have 25. The Religious Education Curriculum P-12 enables students to progressively develop a deeper understanding of the Catholic Christian tradition and an empathetic understanding of the major world religions, as well as be respectful of how believers of various religions live out their respective religious beliefs. This approach respects learners and promotes critical thinking so that students are able to relate it to their own life and positively contribute to building a civilization of love. Catholic schools are known for their high standards, the quality, faith and values-based education they provide, and the broad range of academic and vocational outcomes available to secondary students. Catholic schools focus on a holistic education to provide an educational foundation for the full development of each student – intellectually, spiritually, socially, emotionally and physically. Our schools are welcoming, inclusive, and connected communities where respect for self and others is paramount. The resulting good behaviour is conducive to creating favourable environments where quality learning and teaching can take place. Catholic schools seek to provide a genuine, safe and caring experience for those who are part of their community. Students are encouraged to value diversity, develop a sense of social justice and become valued, contributing members of society. The inclusive philosophy of Catholic schools promotes the human dignity of each student. Catholic schools strive to provide collaborative, supportive and engaging educational environments where all students are given the opportunities to learn and achieve to their potential. Various forms of support are available to all students to enhance their learning and promote their physical, social, emotional and spiritual wellbeing. This includes collaboration and partnership with parents, the provision of learning support, tailored learning plans, social and emotional learning programs, extension plans for gifted and talented, counselling and access to specialist services such as psychology, speech language pathology, occupational therapy, and numeracy and literacy coaching. Supported enrolments are available when a parent identifies that their child requires additional support in the educational environment, for example because of a disability, medical diagnosis, history of difficulty with learning, or concern with speech, hearing or vision. Transition support occurs when a student moves from or into a new educational setting including into Prep, from one year level to another, from primary to secondary school, or to prepare for the most appropriate career pathway throughout life. For students with a disability, required educational adjustments are identified to meet the learning and access needs of students, along with the resourcing necessary to meet the student’s support needs. For further information visit www.cns.catholic.edu.au/your-education/diverse-learners. Don’t let this be a barrier. Catholic schools balance the need to charge fees with their historic role of providing access to quality schooling for all. For those who can’t afford to pay school fees, discounts and concessions are available so that no child is denied a Catholic education based on their family’s financial situation. Sibling discounts and country area discounts apply, along with an automatic 70% fee discount for holders of government means-tested pension and health care concession cards. New or existing families who don’t have a concession card but are still having difficulty paying fees are encouraged to have a conversation with the school principal and seek special consideration. These requests are treated with respect, dignity and confidentiality. If you think a Catholic school might be an option for your child, pay a visit to your preferred Catholic school. Catholic schools have always maintained an outreaching focus, with a traditional and often expressed preferential option for the poor. To enable this outreach, it is essential that parents who can afford to meet their financial obligation, do so, to whatever capacity they are able. Existing families whose financial circumstances have changed are encouraged to speak with their school principal. The mission and ethos of Catholic schools to live the Gospel values of Jesus Christ permeates all aspects of Catholic school life. Because of their outreaching focus and preferential option for the poor and disadvantaged, Catholic schools seek to keep fees as low as possible to allow access to a Catholic education for families who seek it. Fees are therefore significantly less than private and independent schools, particularly in the Diocese of Cairns in Far North Queensland. Because of this foundational core belief to welcome the poor and marginalised and accordingly their lower fees, Catholic schools see themselves as distinctly Catholic, and not private schools. All students in Australia are entitled to a government supported education. By having the freedom to choose a Catholic school for their child, Catholic school parents are effectively helping the government to fund their child’s education, through the school fees and levies they pay. These fees and levies are necessary to make up for the shortfall in government funding that is provided for a child in a Catholic school, compared to funding for a child in a State school. The cost to the government of funding the education of a child in a Catholic school is therefore less than if that child were to attend a government school. Catholic schools face the complexity of balancing the cost of providing the quality, faith-based education for which Catholic schools are known, with the need to keep fees as affordable as possible so that those who wish to choose a Catholic education for their child, can do so. The core value of the Catholic Church to support the poor and disadvantaged means no child is refused a Catholic education because of genuine financial difficulty. Generous concessions are provided in those circumstances, however this outreach must be balanced with the need for those who can afford to contribute, to do so. As a result, Catholic school fees are significantly less than those of private schools, particularly in Far North Queensland.